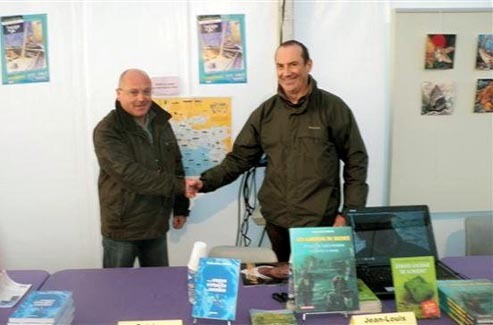 The Cité de la Voile Éric Tabarly organized the third edition of its Sea Books Exhibition. On the 11th and 12th of December, between 11am and 07pm, this site usualy consecrated to modern sailing welcomed a few women and men whose nib is tinged with salt water : about forty sailors and writers as Florence Arthaud, Catherine Chabaud, Pol Corvez, Jean-Louis Maurette or Yvon Le Corre were present to share their passion for sea and Word. 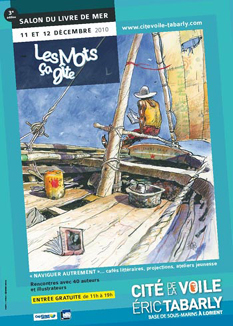 An appointment with everyone, punctuated with many activities for young and older people, with showings, lectures and meetings to discover how « Sail differently », the theme of this 2010 edition. On the left : Eric Le Gall and Jean-Louis, a dynamic team requested by many visitors. 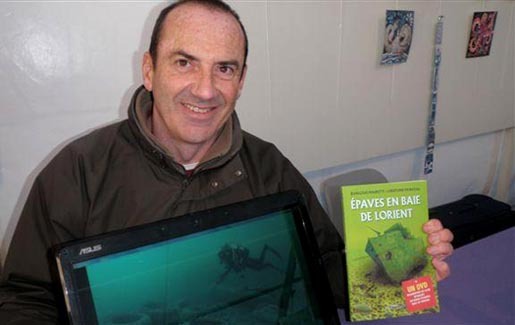 On the right : Jean-Louis was presenting, in preview, the last book writen by L’Expédition Scyllias accompanied with underwater films produced by Sous La Mer Productions.